Home Events Gaming MSI Gaming MSI Gaming is coming in Cebu this December! 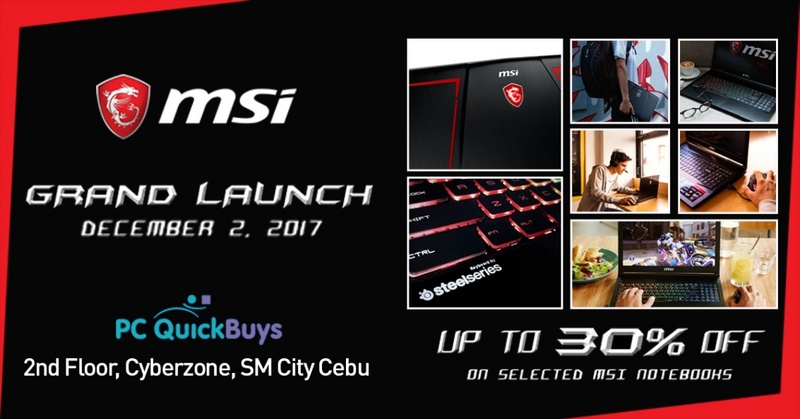 MSI Gaming is coming in Cebu this December! Micro-star International (MSI), the world’s best-selling gaming laptop brand, is taking a big step in announcing their new concept corner to be launch this December 2017. The MSI concept corner, can be found in PC Quickbuys store located at the 4th floor of Cyberzone, SM City Cebu. PC Quickbuys will be the first ever store to cater MSI notebooks in the city. Some of the models that will be available in MSI Cebu include one of the new Raider Series: GE63VR 7RE-018PH and the limited Camo Squad edition, GE62VR 7RF-673PH, from GE Series. These two (2) models are among of the new and high-end models from MSI. Not only that they are built in with the latest CPU Intel i7, both models are also VR-ready with GPU of GTX 1060. Get to see them first-hand and try them for yourselves as demo units will be available at the store for optimum customer experience. The unveiling of the new concept corner will happen on December 02, 2017 at 10AM with ribbon cutting ceremony, activities and discounts of up to 30 percent for customers who will drop by this weekend. MSI announces a Mini Tournament for Tekken 7 game fanatics that will also be held on the day of the launch. Registration for the tournament is now on-going. Take note that only 16 players will be able to compete.